India, Universities and World Ambitions | United We Blog! By creating quality institutions like the SAU and reviving old ones like Nalanda (below) India is trying to establish itself as regional hub of excellence. All the chaos surrounding sloppy preparations for the Commonwealth Games to be held in New Delhi in October may give an impression that India has a long way to go to become a global power. One may cite the overflowing Yamuna running into residential areas of Delhi as a proof that India is still an improvised third-world country that has million of hungry stomachs to feed. True. But make no mistake. India is not watching this all quietly with its hands folded. There are so many progressive activities happening in India today that it is sometime difficult to keep track of all of them. Highways are being expanded all over the country, for example, and competition among foreign companies to open shops in India has only intensified. Take, for example, the two incidents on Thursday which offer an insight into India’s preparations to become an advanced nation with global influence. 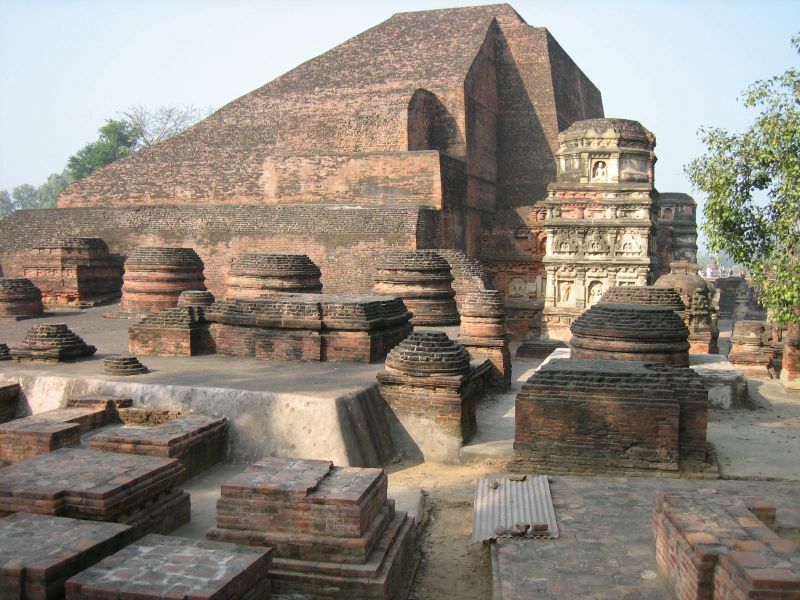 The Indian parliament passed a bill that authorises the government to revive an ancient university in Nalanda, Bihar. Nalanda University will be an Indian answer to Oxfords and Cambridges of the West, said parliamentarians across the political spectrum before ditching their ideological differences to vote unanimously for the bill. Lawmakers were full of praise for the Indian heritage that once produced universities like Nalanda, Vikramsila and Pushpagiri centuries ago that, as centers of excellence, attracted students from foreign countries. On the same day, in a quiet corner of the mammoth campus of Jawaharlal Nehru University in Delhi, the South Asian University began its first ever academic session without much fanfare. In Nalanda and the SAU one could see an India of future: a country that rises to the leadership role while closely working in cooperation with nations of its immediate and extended neighborhood. The SAU, in fact, is a joint effort of the eight South Asian nations that are also the members of the SAARC with India at its helm. Nalanda, on the other hand, is a joint effort of India and the South East Asian countries, with the former as the host and initiator. Though the SAU in appearance is a SAARC effort, it would be untruthful to say that all eight countries are equally involved in it. It is the Indian Prime Minister Manmohan Singh who actually floated the idea of such an international institution of higher learning in 2005 SAARC summit. In the past five years since introducing the idea of the SAU, India has successfully brought together all SAARC nations on board to make the idea a reality. Apart from constructing a campus in 100 acre land in South Delhi for the SAU on its own, India will contribute more money than any other SAARC nation for the operation of the university. The university can also be considered a litmus test for India’s leadership capability in the region. If the university fails to become what India wants it to be (a world class institution) its neighbours will no doubt question its capacity to lead the region. The SAU should not be another JNU which by the way is a great institution on its own right. But it’s still an Indian institution. 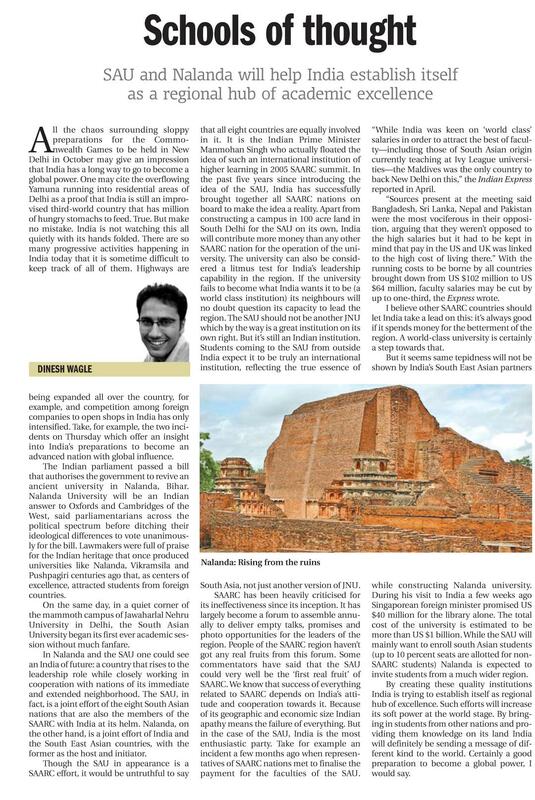 Students coming to the SAU from outside India expect it to be truly an international institution, reflecting the true essence of South Asia, not just another version of JNU. SAARC has been heavily criticised for its ineffectiveness since its inception. It has largely become a forum to assemble annually to deliver empty talks, promises and photo opportunities for the leaders of the region. People of the SAARC region haven’t got any real fruits from this forum. Some commentators have said that the SAU could very well be the ‘first real fruit’ of SAARC. We know that success of everything related to SAARC depends on India’s attitude and cooperation towards it. Because of its geographic and economic size Indian apathy means the failure of everything. But in the case of the SAU, India is the most enthusiastic party. Take for example an incident a few months ago when representatives of SAARC nations met to finalise the payment for the faculties of the SAU. “While India was keen on ‘world class’ salaries in order to attract the best of faculty—including those of South Asian origin currently teaching at Ivy League universities—the Maldives was the only country to back New Delhi on this,” the Indian Express reported in April. “Sources present at the meeting said Bangladesh, Sri Lanka, Nepal and Pakistan were the most vociferous in their opposition, arguing that they weren’t opposed to the high salaries but it had to be kept in mind that pay in the US and UK was linked to the high cost of living there.” With the running costs to be borne by all countries brought down from US $102 million to US $64 million, faculty salaries may be cut by up to one-third, the Express wrote. I believe other SAARC countries should let India take a lead on this: it’s always good if it spends money for the betterment of the region. A world-class university is certainly a step towards that. But it seems same tepidness will not be shown by India’s South East Asian partners while constructing Nalanda university. During his visit to India a few weeks ago Singaporean foreign minister promised US $40 million for the library alone. The total cost of the university is estimated to be more than US $1 billion. While the SAU will mainly want to enroll south Asian students (up to 10 percent seats are allotted for non-SAARC students) Nalanda is expected to invite students from a much wider region. By creating these quality institutions India is trying to establish itself as regional hub of excellence. Such efforts will increase its soft power at the world stage. By bringing in students from other nations and providing them knowledge on its land India will definitely be sending a message of different kind to the world. Certainly a good preparation to become a global power, I would say. The idea of Indian PM Mr.Manmohan Singh to have South Asian University with standard of world class university,certainly,neeeds to highly appreciated.But,at the same time as mentioned in the article it should not be another JNU because JNU could be termed best Indian university but not a fully international standard.So,if India could not leave the mentality it has been shown towards it’s neighbours,the the aspiration of south Asian people to see SAU as a world class university could never be converted into a reality. As india’s co-operation and enthusiasm is at its extreme,all of the SAARC member nations including non-saarc asian nations should let india play the vital role regarding the matter of SAU.India’s attitude and keen intrest towards the University has shown its willingness of globalizing the education almost on its own.However,rest other invovled nations have not only hoped but wanted india,this time,to show altruism in this joint effort.Let’s expect that india won’t make this university another JNU. Of course, quality institutions in India is trying to establish itself as regional hub of excellence.Bangalore,chennai and as a whole south India has been a centre for educational, scientific and research institutions. but India is facing economic,terroism military and environmental challenges to the governance of the region.